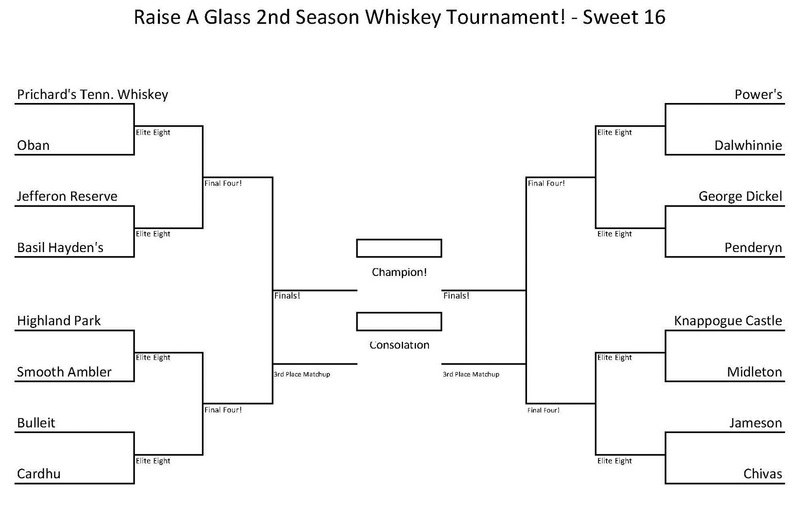 Our whisk(e)y tournament had gone from 68 spirits down to the Sweet 16 throughout November and December of 2011. For the full look at how we figured out the field of 68, check out last week's post. 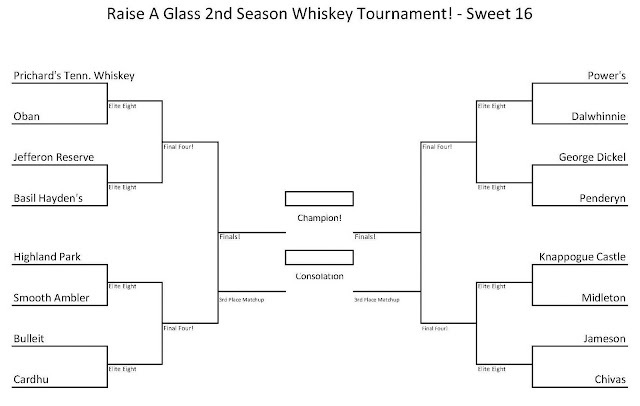 My #1 seed, Blanton's bourbon, got knocked out by 16 seed Prichard's Tennessee Whiskey... that's some good stuff! Eric and James each had their #1 seeds make it through the first two rounds so Power's and Highland Park stayed alive. Tullamore Dew, Jeremy's top seed, got eliminated by a different Irish whiskey, Knappogue Castle. We spent two weeks taking this field of 16 down to the Elite 8 then another week of tasting over the airwaves to get to our final four. The 16 whisk(e)y listed below are certainly all worth taking a look at. Some had much tastier roads to get to where they are. James and Chivas in the bottom right bracket eased their way into the Sweet 16 and that match-up really wasn't worthy of being held this far into the tournament. For the most part, the rest of them are all worth putting your liquor shelves. Quite a few of these have been reviewed on other Whisk(e)y Wednesday posts, but not all of them. That will come in time! Next week we'll look back on the Final Four!